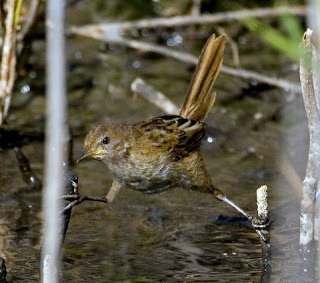 The Little Grassbird is often described in terms that allude to the difficulty of finding them. Elusive, skulking, and wary spring to mind, and I've used those terms myself. But after spending several hours watching and trying to photograph them, mostly without result, I think they might alsol be described as gymnasts! I hadn't really considered it until recently, but their World is almost completely made up of vertical perches (at least for those that inhabit the reed beds) and that in order to get about, they really do have to resort to a form of gymnastics, much as the juvenile pictured at top right. gather the crakes have been twitched by a number of local birders, some at least, having great views. I can give a passable imitation of the grassbird call, which consists of 3 or 4 rather tuneless notes, often described as plaintive. I say it's passable only because, occasionally, a grassbird replied. Listening over some hours, I realised that different birds had quite different calls, perhaps essential given their environment. Some had 3 notes with equal spacing between notes, some 4. Others added a last note at a different pitch, others varied the spacing. All appeared to be consistent enough to believe that individuals had different calls. I rarely see them out of the reed beds at this lagoon and I'm beginning to realise why. While I waited patiently for them to emerge and feed on the fast drying mud, I could see movement of the reeds as they neared. They would then watch me, sometimes from less that a metre away, but still concealed in the reeds. Very galling! Well I managed a few shots, some of youngsters, nothing flash, but I did get a whole lot better acquainted with them. Ahh! The things you can learn standing knee-deep (hopefully no deeper) in smelly mud! Ah, the mud! Thanks for reminding me, John. Despite wearing gumboots, I managed to just about cover my jeans with, well it deserves a more pithy name than mud, and I've thrown them out. But I'd sacrifice them for the chance to have close encounters with grassbirds and more especially, the crakes, anyday. I have only recently discovered Gould's Lagoon (due to a summer ranger activity for kids there) and I'm very keen to get back there! The best spots are rather dependent on the water level, as they appear to prefer feeding on the wet mud. The good news is that you won't need your gumboots! The recent photos were taken at the reed beds nearest the road junction with the highway. There's some chicken wire, presumably there to keep waterfowl off the road, and if you wait patiently somewhere in that corner, facing towards the hide, you may see crakes feeding out in the area immediately in front of you. However, I recently returned to the lagoon, and saw Spotless from the bird hide. They usually feed close to the reeds, to the right as you face back along the walkway, but keep an eye out for them anywhere along the fringes of the main reeds. They are small and appear, and disappear, quickly. Patience is required. Amazing, I followed your directions and there were the birds, right on cue! I had great views of both the Spotted and the Spotless, between about 7.30 and 8.00 am. Also saw a few Little Grassbirds (or the same one a few times) in that corner near the road junction. I don't know how you took such good photos as they never stay still for very long. 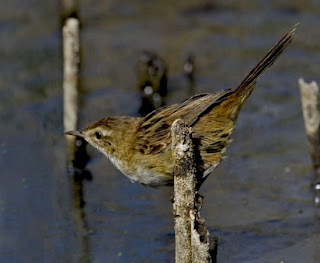 The Little Grassbirds were also near the hide, along with a Clamorous Reed-warbler. The two appeared much more similar in reality compared to the pictures in fieldguides, I guess because of their quick movement and the dappled shade they hide in. All in all I had a very pleasant morning, no-one else around and very obliging wildlife. Thanks for the directions!